NYC Tattoo Artist BamBam asks his celeb clients to give HIM a tattoo- Justin Bieber gave him this tattoo....and someone dressed up as the "tattoo" for Halloween! Celebrity Tattoo artist Bam-Bam (based in NYC) is known for inking famous bodies including Rihanna and Justin Bieber. Bam-Bam often asks his celeb clients to give HIM a tattoo, on a spot he has reserved on his arm for the star-artist's work. Justin Bieeber may have gave him the doughiest tattoo off them all....a rabbit (???) with the word "Swaggy" scribbled next to him. 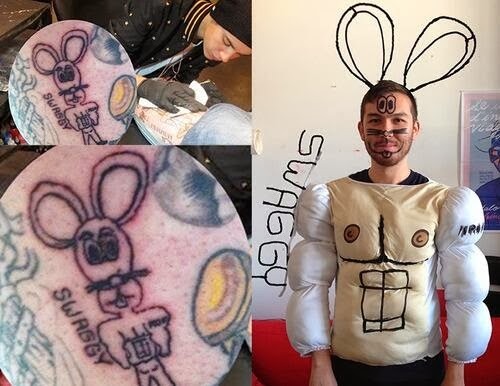 Leave it to a creative Halloween-er to take the terrible ink to the next level...and DRESS UP as the SwaggyBunny. The below pic definitely brings the "LOL's"! Original tattoo is on the left.